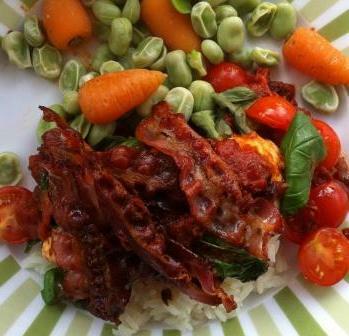 This is one of our gluten-free recipes that is a tasty regular weekday meal. 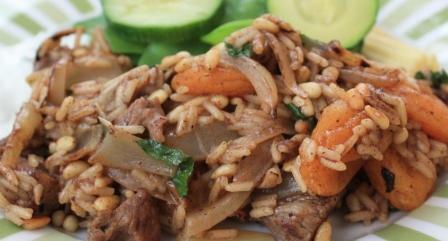 As with our Gluten Free Turkish Lamb Pilau recipe this recipe starts with toasting pine nuts. This will fill your kitchen with the most wonderful aroma that will have enthusiastic friends and family begging to know “is it ready yet?” A nice position for any cook to be in. When making gluten-free recipes such as this gluten free Moroccan lamb pan fry recipe following a few simple rules will ensure your gluten free lamb stays gluten free, we have some easy to follow tips on our Avoiding Gluten page. This Gluten Free Moroccan Lamb Pan Fry recipe will serve 4 people. 4 pak choi (or 1 bunch chard). 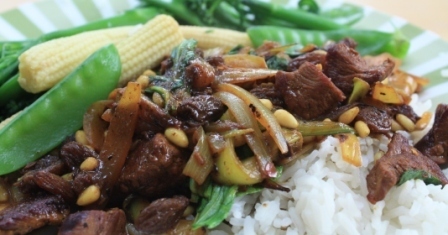 We couldn’t find chard in our supermarket when we first started making this recipe and substituted pak choi. It worked so well we have used pak choi ever since. 1. Toast the pine nuts in a dry frying pan. 2. Strip the pak choi (or chard) leaves from the stalks. Cut the stocks into batons and roughly shred the leaves. Set aside separately. 3. Heat the oil in a frying pan and fry the lamb for 5-6 minutes over a high heat until browned. 4. Add the onion, garlic, pak choi (or chard) stalks and spices and continue to cook for 3-4 minutes until softened. 5. Pour over the stock and scatter in the raisins, then simmer for 4-5 minutes to make a sauce. 6. 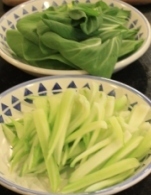 Stir the pak choi (or chard) leaves through the stock to wilt, season and serve garnished with the pine nuts. Serve with rice and vegetables and some plain yogurt (optional).